China has suspended imports of some whey protein and milk-based powder sourced from Fonterra. Chinese dairy companies are basking in a rare moment. This time, they're not the ones under scrutiny for food safety -- it's a New Zealand firm. Over the weekend, the world's largest dairy exporter, Fonterra, revealed that some of its products were contaminated with a bacteria that could cause botulism. The bacteria was found in whey protein, produced by the New Zealand company, for sale to other companies for use in consumer products. Now, China has suspended imports of some whey protein and milk-based powder sourced from Fonterra. This isn't great news for New Zealand, as China is its top trading partner. But it's turning out to be a bit of a boon for some Chinese dairy and infant formula companies. Guangzhou-based infant formula maker Biostime and China Modern Dairy both surged by 9.8% in Hong Kong trading. Yashili International closed up 2.5%. China Mengniu Dairy closed down 1.4%, erasing earlier gains. At the same time, Want Want China, a company that sources most of its raw milk from Fonterra, tumbled 3.2%. Chinese families, fearful of tainted formula, have been scouring the globe for milk they perceive to be safer. 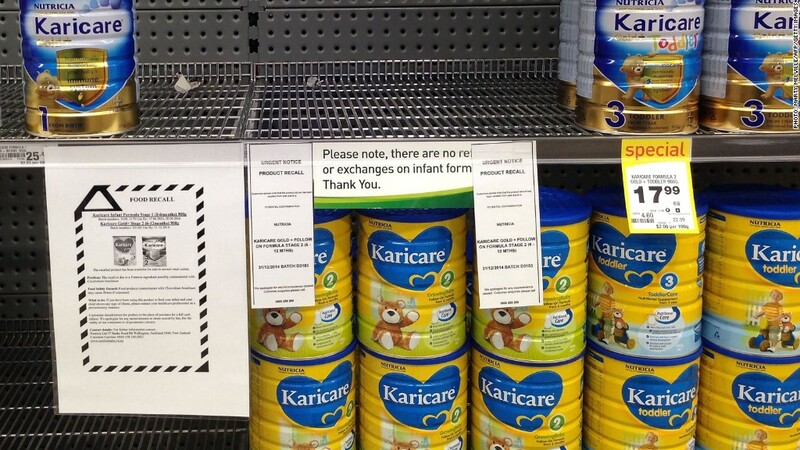 The rush has created shortages as far afield as the U.K. As a result, foreign baby formula brands such as Nestle (NSRGF) and Mead Johnson (MJN) have surged in popularity. Not all foreign-sourced baby formula have continued to benefit from Chinese consumer preferences for non-domestic brands. Infant formula products from New Zealand have received additional scrutiny lately as Chinese companies have been buying up dairy farms in the country. "People are saying they don't trust it any more than a Chinese source," said China Market Research analyst Ben Cavender. Consumers are becoming more concerned, Cavender said, that there's greater risk of "cutting corners, cutting costs" as Chinese businesses become more involved. Last year, the New Zealand government approved the sale of 16 farms, including dairy farms, to Chinese developer Shanghai Pengxin Group.